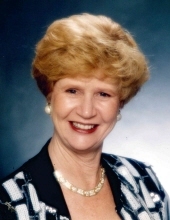 Virginia Waggoner Hicks - a native of Morton, MS and a longtime resident of Semmes, AL, died Sunday, April 14, 2019 at her residence. Mrs. Hicks was a longtime member of Springhill Baptist Church and retired as an elementary school teacher from the Mobile County Public School System and North Mobile Christian School. After retirement, she taught at Cottage Hill Baptist School and was a tutor for many young people in her community. She was a loving, mother, sister, grandmother and friend. Mrs. Hicks was preceded in death by her husband, Mack O. Hicks; her parents, Ottis Carleton Waggoner and Earline Bennett Waggoner; one sister, Kay Ellis; and her grandparents, Clifton and Maybeth Waggoner and Eph and Maudell Bennett. She is survived by two daughters, Jessica Hicks and Dana (John) Chapman; one brother, James Waggoner; one sister, Sheryl Corder; three grandsons, John D. Chapman, III, Mack A. Chapman, and Alex B. Chapman; nieces, nephews and other relatives. The family will receive friends from 11 A.M. until 1 P.M. on Tuesday, April 16, 2019 at the Springhill Baptist Church Chapel with a funeral service to follow at 1 P.M. Graveside services and interment will be held at 10 A.M. on Wednesday, April 17, 2019 in Pine Crest Cemetery. Arrangements by Ascension Funerals & Cremations, 1016 Hillcrest Road, Mobile, Alabama 36695. To plant a tree in memory of Virginia Waggoner Hicks, please visit our Tribute Store. "Email Address" would like to share the life celebration of Virginia Waggoner Hicks. Click on the "link" to go to share a favorite memory or leave a condolence message for the family.